Offers: Special afternoon ofers. Contact club for more information. Clubhouse with changing rooms, bar, restaurant and pro shop with buggy and trolley hire. 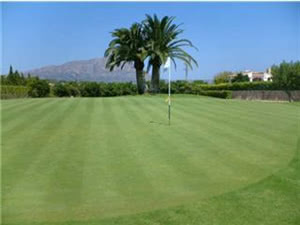 Golf club also has a practice range, putting green, tennis courts and swimming pool on-site. The course was designed by Francisco Moreno and opened in 1981. Situated 100 kilometres from Alicante on the way to Valencia, and sheltered from the wind by Cape San Antonio, the course has a perfect microclimate all the year round, and is located in a wonderful natural setting, surrounded by pinewoods. The course is a gently sloping 9 hole course with well-maintained greens and fairways flanked by palm trees, pine trees and orange trees. Although it has only 9 holes, on the second time around or back nine, many of the holes are played from different tees making it virtually an 18 hole course. Also the 4th / 13th green is large enough to accommodate two separate pin positions for each hole. The 6th presents difficulties, a par 4 with splendid views from a plateau green requiring a safe and precise drive to the dogleg. The 120 metre 16th is the shortest hole and the 475 metre 5th is the longest. Although it is not very long, it is certainly challenging as it is plagued by bunkers nearly all the way round - 34 in total, and all of the greens have subtle runs, many of which are difficult to read.